In WordPress, you can write either Posts or Pages. A Post is a regular blog or news entry. 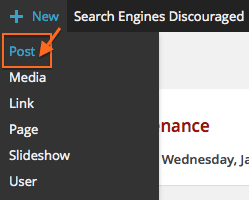 By default, posts automatically appear in reverse chronological order on your site’s home page. A Page is for content such as “About Me,” “Contact Me,” etc., information that lives outside of the normal blog chronology and is often used to present information about yourself or your site that is somehow timeless – information that is always applicable. You can use Pages to organize and manage any amount of content. You can also make a static page your front page instead of the standard blog listing. In general, Pages are very similar to Posts in that they both have Titles and Content and can use your site’s Presentation Templates to maintain a consistent look throughout your site. Pages are not Posts, nor are they excerpted from larger works of fiction. They do not cycle through your blog’s main page. Pages cannot be associated with Categories and cannot be assigned Tags. The organizational structure for Pages comes only from their hierarchical interrelationships and not from Tags or Categories. Either method will bring up the Add New Post/Post screen where you will write your post/page. Title – The first field is the Title of your post. By default, this will also be included in the Web address (Permalink). After you have saved a draft, you can change this by clicking the Edit button below the title. Type or paste your content in the Post Editing Area. Post Editing Area – The large text area is where you will write the Body of your post. WordPress includes a visual editor and an HTML/Text editor if you prefer to hand code. (Only basic HTML is allowed, no scripting.) If the right side of the editing area is covered by panels, you will need to widen your browser window and/or collapse the panels. You can Preview or Publish your Post or Page by clicking on the Preview or Publish buttons in the Publish pane. Hint: Click the Screen Options tab again to collapse this view. Add Media – WordPress allows you to add media to your post, like images, audio or video files. The feature is located directly above the editing area. Excerpt – A short summary of your post. Some themes take advantage of excerpts in archive lists. Discussion – You may decide whether to allow people to comment on the post you’re currently writing. The default is the global setting located in Settings > Discussion. 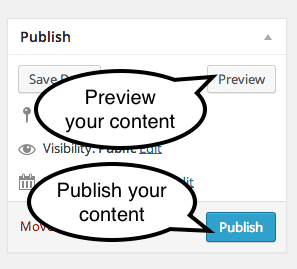 Publish – This is where you can save, preview, set the status, set the visibility and schedule the publishing of the post. Click Publish when you are ready to post. 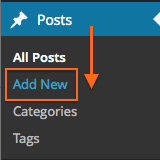 Categories – This is where you can assign posts to Categories. Readers can browse specific categories to see all posts in a category. To add a new category, click the + Add New Category link in this panel. You can also manage your categories by going to the Admin Panel and selecting Post > Categories. Tags – This is where you can add Tags to your post. Tags are essentially micro-categories for your blog. Posts with similar tags are linked together when a user clicks one of the tags. Tags have to be enabled with the right code in your theme for them to appear in your post. Making changes to a published Post or Page is easy. Login to your website or blog. Navigate to the Post or Page you want to edit. Click the Edit Page (or Post) link in the Admin toolbar at the top. Many themes also have an Edit link somewhere on the page when logged in.